The wing menu at Danny's Wok is the subject of a viral Twitter discussion. West Philly Chinese food restaurant Danny's Wok is the subject of a new Twitter debate after a photo of the spot's wing menu – and its seemingly illogical price points – went viral. 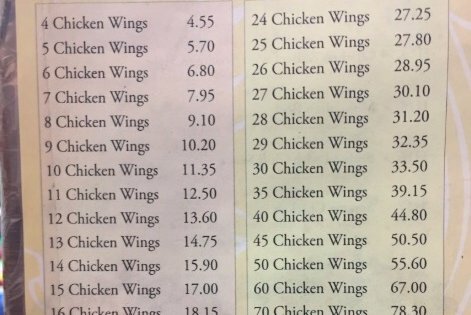 One Facebook user posted a photo of the menu, which has pricing for party trays up to 400 wings. The menu and the pricing reflect an unusual and still unscrutable pattern. The mystery soon ensconced many on Twitter who set out to bring rhyme and reason to the menu, and to better determine which price offered the best deal. get 24 chicken wings instead of 4 and save.... five cents per wing??? get 80 wings instead of 4 and save.... $1.90! # 24 is very strange, and it's hard to predict what happens once they go in leaps of >1, but this formula works up to 50. Though it seems impossible to crack the code on why the wings were priced this way, one user at least was able to summarize the best deal available: if you're ordering less than 25 wings, choose multiples of three for the best cost-per-wing unit. If you're ordering more than 25 wings, the price points at 25, 50, and 75 wings are the best deal per wing. Also, not to add more confusion, but the pricing on the menu online is also different. Guh.